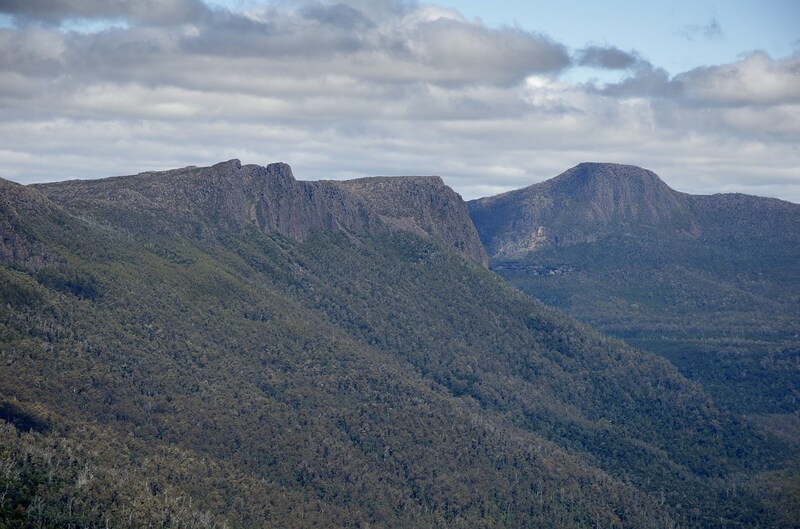 Mount Pillinger is walked from the end of the Arm River Road, up the Mersey River valley behind Mole Creek. 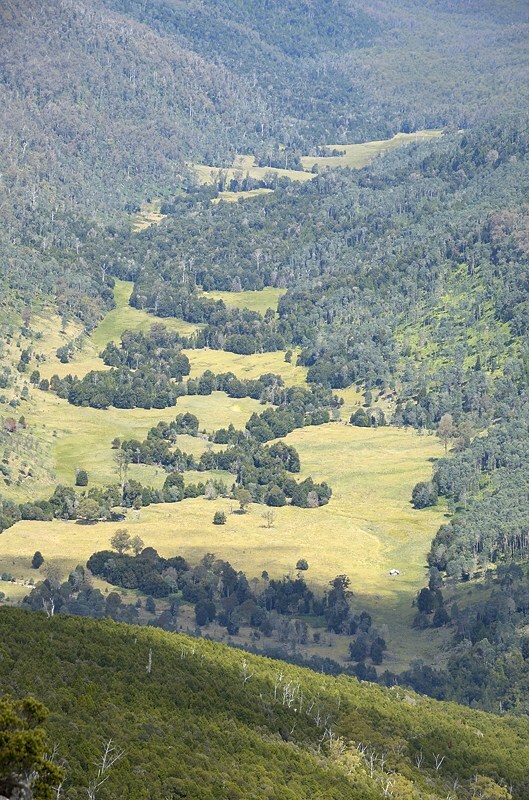 This is the same walk start as the standard walk-in to Pelion Hut on the Overland Track. Walk Description coming soon. Having "walked around the mountains" previously, I was keen to try climbing both Mt Pillinger and Twin Spires on Cathedral Mountain. I had wondered if I might climb Mt Pillinger as a side-trip at the end of that earlier walk, but in the rain of my last day it didn't seem like a brilliant plan. 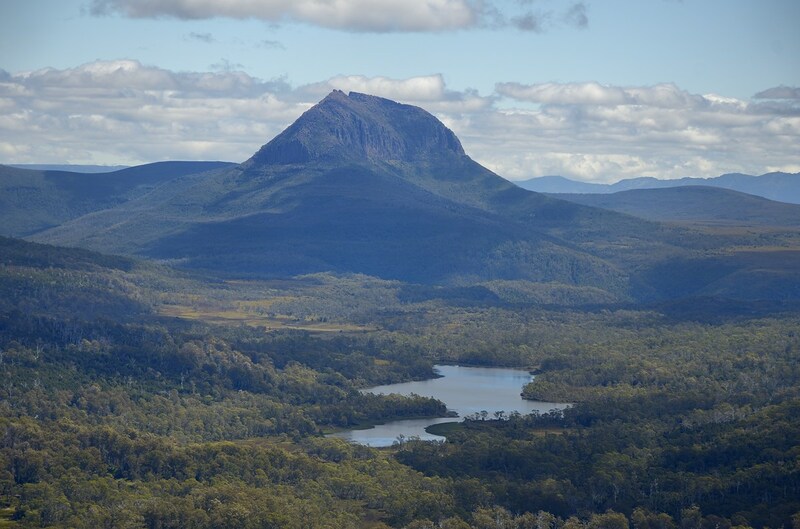 Mt Pillinger is quite impressive from several places, not least down the Mersey Valley from Kia-Ora. I've seen it a few times from there, and spent some time getting a sunset photo from near the tent platforms this last time, on a beautiful evening. 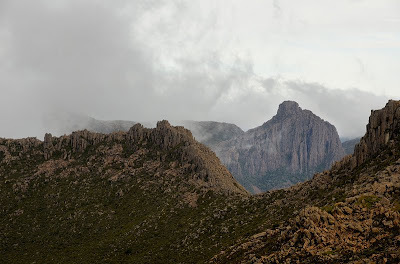 What a lovely prominent peak, steep cliffs, all massive dolerite, definitely seemed worth climbing, and its position suggested it would have great views from the summit. I've found that if I want to really understand the shape of the land, I have to climb every mountain in an area several times, in various weathers and light. Then I start to understand how the hills and valleys, ridges and rivers, cliffs, peaks, creeks, lakes and forests all work together to give us the landscape. What can I see from here? How does it look from here? What shape IS that ridge I can see from over there? I've climbed the peaks of the Huon, and have started to get a three-dimensional understanding of what I can see. 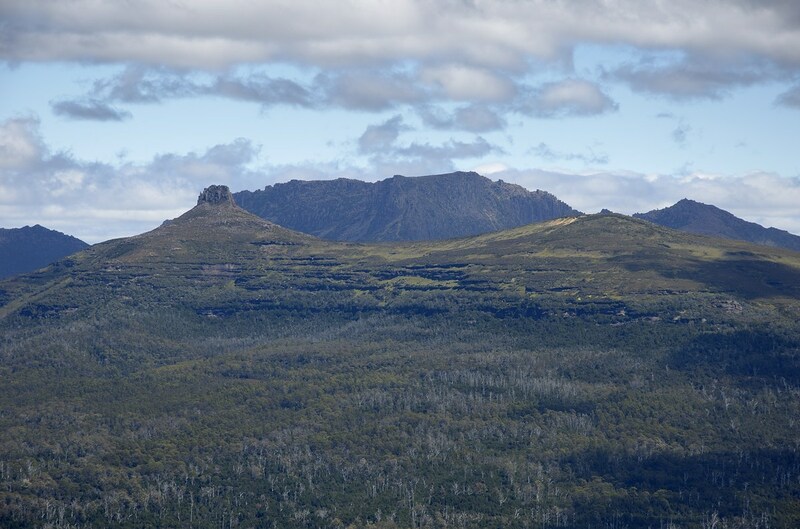 Mt Pillinger, and Cathedral Mountain, looked like really great places to view this spectacular area from - The Du Cane Range, the Pelions including Mount Ossa, Cathedral Mountain. I expected to see all these. In fact, when I got there, the view was indeed fit to inspire a lifetime of walking. The walk description provides the explanation of the route. Suffice to say that I did indeed manage to find an "alternative" route, as usual, which fortunately only added about half an hour and two kilometres to my trip. I suspect my impromptu sidetrip actually heads back to a different point in the confused road network in the upper Mersey River Valley. 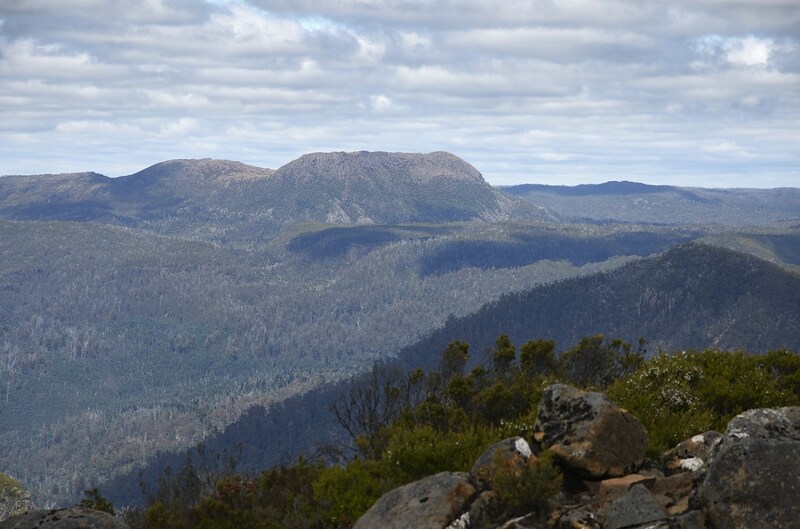 Mount Rogoona from Mount Pillinger. 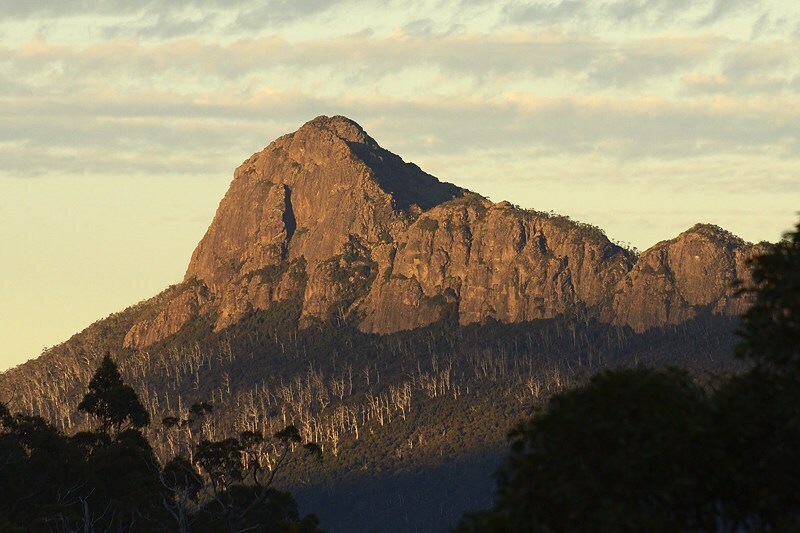 Mount Rogoona is stretched out across the view when viewed from here. When it's viewed from Lake Myrtle, it's steep and prominent, the view being really along the ridge. From Pillinger we see it side-on, and can also see to the left of it the ridges which have to be crossed to climb it from the saddle. I see from here that it's no wonder it took me a while and I have a strong recollection of wandering across those misty ridges, not always sure where I was, nor exactly where the top might be. Interestingly, it's hard to pick out exactly where Lake Myrtle lies, the hills on this side of it meld into the slopes of Mount Rogoona, and perhaps it's only really visible from Mount Rogoona. From here though, I can see the forested slopes which fall away into the Mersey Valley - this is where one of my earlier "impromptu routes" headed - I think this is what is called the Jacksons Creek Track, and it heads from Lake Myrtle down to the end of the Mersey Forest Road. 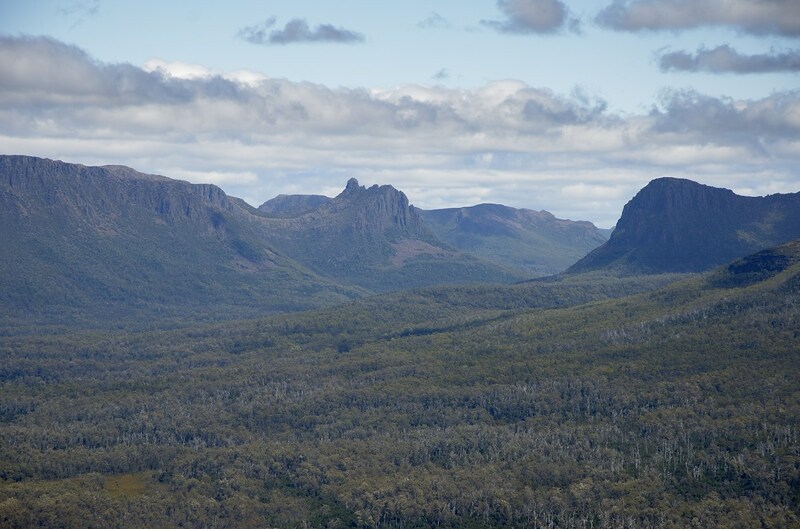 Du Cane Range from Mount Pillinger. I'm headed here over the next few days, the plan being to walk up to Chalice Lake and climb Twin Spires. It's an Abel, and promises even more central views than Mount Pillinger. The cliff line from Cathedral Mountain running down the Mersey Valley is visible from here. I saw these a few weeks earlier from Lees Paddocks, from where they were mysterious imposing crags, appearing occasionally through the clouds. I'm always taken by the way 30 degree slopes seem pretty much vertical when you're looking straight up them. Even more so when you have a week's worth of food and gear on your back. I walked down to Lees Paddocks a few weeks earlier in the rain, the first time I had ever visited them. From Mount Pillinger Lees Hut is easily seen, laid out in the sun. It was drizzling when I was there, but I could see cliffs high above which my new friends confirmed belonged to Mount Pillinger. I don't think I could see the summit for cloud, but given I can see Lees Paddocks from the summit, it follows that the opposite is possible! Mount Hyperion (centre) with the south ridge of Mount Ossa (right). Quite some years ago I walked out to Lake Helios at the northern end of the Labyrinth, and climbed Mount Hyperion. It's a very distinctive mountain with the impressive summit tower seen in this photo, and featured on the cover of the first volume of The Abels. You can also see it from the climb to Mount Ossa. It has some scrambling near the top, which I have to admit I had to think about as I ascended. The views from the peak were awesome, only slightly impacted by the concept of having to climb down again. Having managed that, I recall being completely unable to detect any light above my tent as thick cloud descended during the night. By morning it had cleared, and I photographed the most stupendous view of Mount Ossa and Mount Pelion East in the sunrise. They were on film, and I must see what I can do to produce better versions. Mount Ossa and Mount Pelion East fill a good swathe of the view. I've only had a view from the top of Mount Ossa once, but I have a 360 degree panorama from that morning. Unfortunately it's on film, so not trivial to actually produce. I should see what I can do with it in today's software. I love the view of the sedimentary rocks below the dolerite caps here. Mount Pelion West and Lake Ayr from Mount Pillinger. I haven't climbed Mount Pelion West. I've heard it has large dark holes between vast boulders. They've made it more difficult by limiting where you can camp (legitimately) before climbing, but I suppose I'd better climb it sometime. See the 360 degree panorama. It shows all the above views, and I think it confirms Peter's sentiments about the views from Mount Pillinger.